Its the first week of November 2018 and at the same time last year (October/November/December 2017) "Cryptocurrency" was trending all over the place. But this time around the waves seems to be changing. According to Google Data (Google trends to be precise) the term "Blockchain" is becoming more popular search term than the last year's sensation "Cryptocurrency'. First time when "Blockchain" overtook "cryptocurrency" was way back in July. 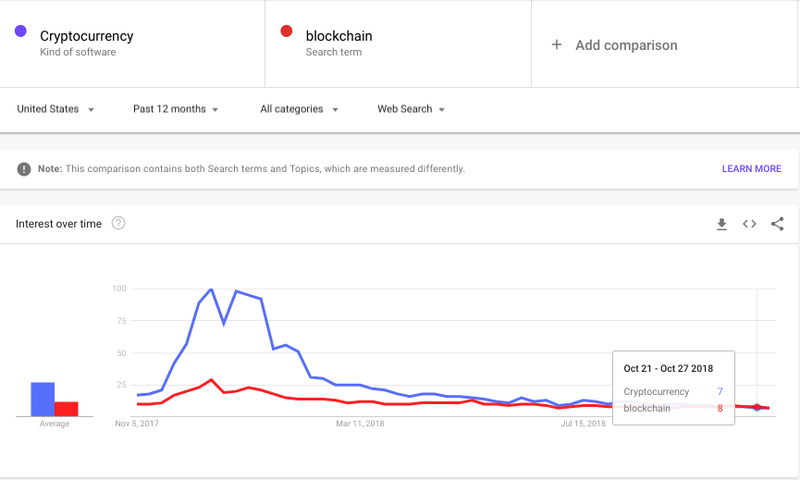 And after September of this year "Blockchain" has consistently attracted significantly more searches than "cryptocurrency"
Bitcoin still remains the King though in terms of searches by far. Google Trends suggests that Bitcoin is atleast 15X more popular than both cryptocurrency and blockchain. One important thing to note here is that the Trends only shows the relative popularity of a particular term. As per the google's blog about the Trends "the resulting numbers are usually scaled on a range of 0 to 100 based on a topic's proportion to all searches on all topics". As such if an individual is more intrested in finding out the exact real number of searches (with almost 80-95% accuracy), they can check out the data from ahrefs themselves by clicking here. Ahrefs is beleived to have more accurate searche volume results. This whole things does proves the fact that the sentiment of the tech of blockchain will outlast the idea of cryptocurrency (like ethereum, monero). I believe this trend is here to last!